As powerful scripting language that is free and easy to use, PHP has become a common tool for developing dynamic and interactive web pages. Using PHP Composer to manage dependencies for a project make development with PHP even easier. Artifactory is a fully-fledged Composer repository which can be accessed by the Composer through its command line interface. You can user Artifactory’s Set Me Up feature to get the code snippets needed to configure the client to manage dependencies through your Artifactory Composer repositories. 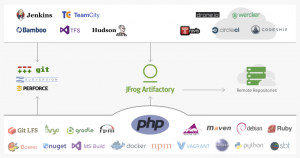 Artifactory is a proxy to both Git Hub and Packagist or other remote resources for PHP index files or actual binaries. By caching both index files and binaries in a remote Composer repository, Artifactory renders you independent of the external network or of any external resources which may go down. Artifactory provides a security solution that lets you control access at several levels that determine both who is accessing your repositories, and what artifacts may be hosted in them. As a first line of defense, Artifactory lets you define “Excludes” and “Includes” for access so you can control which components can even be stored in any particular remote repository. Then, using permissions you have fine-grained control over who can access your repositories, and you can even control who accesses your servers through Artifactory’s integration with LDAP, Active Directory, SAML, Crowd and others. Since Artifactory caches remote artifacts locally, they are available on the local network to both developers and build machines resulting in reduced networking and therefore, faster builds. Artifactory provides many ways for you to search for packages. Naturally, you can run a search based on attributes such as name, version, timestamp and other basic attributes, but Artifactory also lets you search by checksum, so even if a package has been renamed you can uniquely locate it. Artifactory also offers common built-in searches, such as “latest” version, or search based on custom properties. The full power of search comes with the flexibility of AQL that lets you define search queries to any level of complexity needed. As a PHP Composer repository Artifactory streamlines both front end and back end development with PHP letting the developer concentrate on writing code without having to worry about security, or availability of GitHub or Packagist.